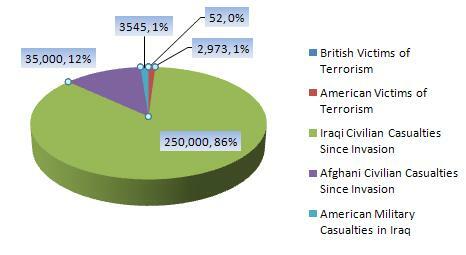 Every 9.62 days, there is an equivalent amount of casualties in Iraq & Afghanistan as September 11th. There are 9.65 Virginia Tech shootings in Iraq & Afghanistan everyday. 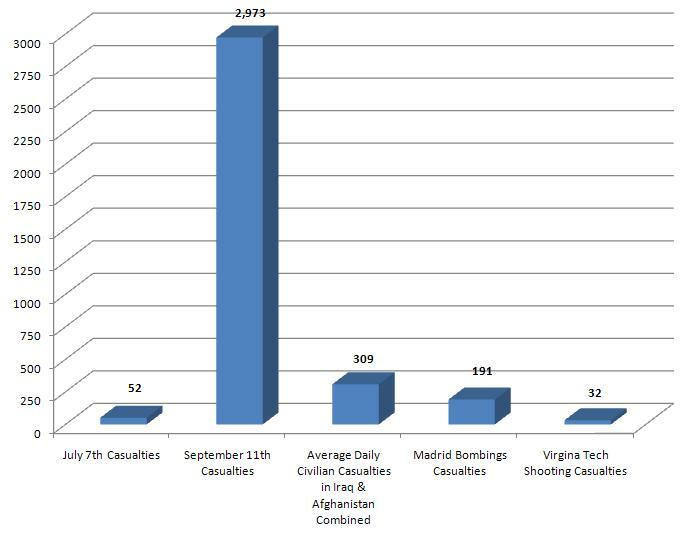 There are 1.61 Madrid bombings in Iraq & Afghanistan everyday. In 11 days as many Iraqi & Afghani civilians are killed as the entire amount of American military personnel killed since the invasion of Afghanistan in 2002 and the invasion of Iraq in 2003. 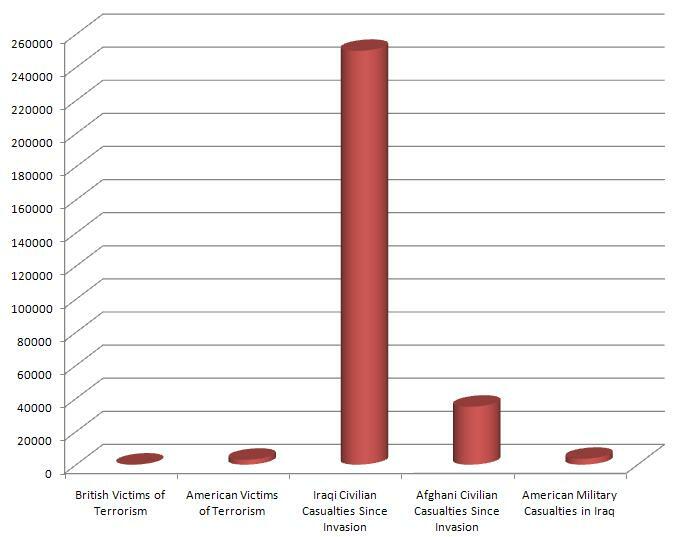 Note: There is some discrepancy between various sources on the amount of civilian casualties since the US-led invasion in March 2003. A study in October of 2006 listed over 650,000 killed (see Washington Post article below) while other sources vary from 400,000 to just over 60,000 (see British-government funded Iraq Body Count below). I computed 250,000 by averaging several sources, though I personally feel this is a low number. Update: The differing methodologies among these studies led to these wide variations. For example, the lowest figure from IBC is based solely on media reports of violent deaths, while the Lancet study surveyed random families in Iraq and includes non-violent war related deaths, such as those dead to lawlessness and collapsed infrastructure. I computed 250,000 to use as a useful estimate by averaging these sources, though I personally feel this is a low number when talking about the impact of the US invasion on Iraq.